A private session entitles you to an hour and a half in the Gong Room in Chorlton…. a wonderful gift for someone you care for. Gong baths can be the most luxurious experience, a departure from the way we feel about our every day concerns, a mind-opening experience that can help us enter into meditative states and become available to profound insights. 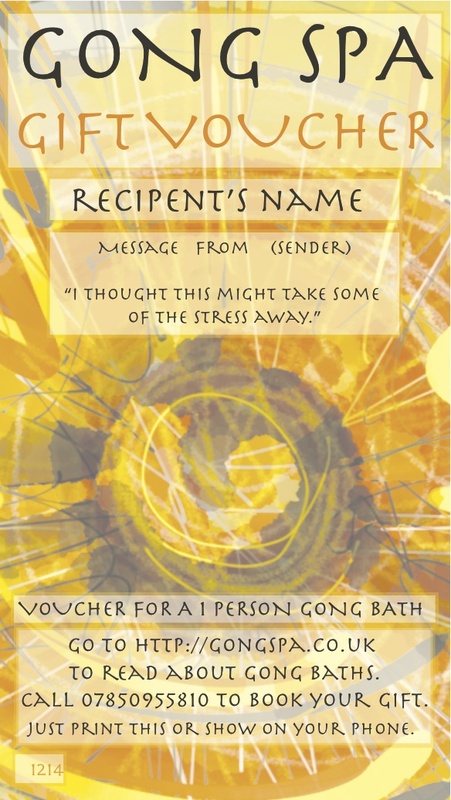 Once you have given the Gong Spa Voucher to your friend, they can contact me at their convenience using the details on the voucher to arrange their gong bath. A group session can be at any of my public group gong baths. Prices vary and it’s also worth letting your friend know that it’s wise to book early, as these sessions frequently fill up before the day of the event.